Srinagar – How to Plan your Trip and Explore? Shah Jahan a long time ago aptly called Kashmir the paradise on earth; and Srinagar happens to be quite the heart of that paradise. With its serene blue lakes and magnificent gardens ringed by an Arc of Majestic Himalayas; it is a picture perfect town that looks straight out of a painting. There is just so much to see here and so much to do. This I believe is the very reason that despite all the unrest and tensions; Srinagar continues to remain one of the most visited tourist destinations of our country. It is a year round magnet that draws tourists’ right from the month of January till December. Out here, you will find a wide range of travelers; right from adventure enthusiasts to families out for vacations to honeymooning couples. Valleys covered in snow in winter and a mild climate in summer added with feisty Kashmiri cuisines is what makes Srinagar India’s top domestic tourist draws. Depending on the time you have in hand, you can spend days in Srinagar; visiting places and exploring valleys. How you can plan a trip to Srinagar is what I will be discussing in this article; providing necessary information on places to visit, where you can stay and how you can travel around. Is Srinagar safe for Tourists? First question that comes to mind when visiting Srinagar, or Kashmir in general, is whether or not it is safe to go. I have covered this topic in details in a different article Is Kashmir Safe for Tourists to Travel; but if I was to answer this in one line then yes, Srinagar is as safe for tourists as any other city in India; provided that you keep yourself safe. People of Kashmir are very sensitive towards tourists because even they realize that a large part of their livelihood depends on tourism. So as long as you stick to major tourists areas, do your homework before reaching there; and do not go wandering in areas where you aren’t meant to be; then yes, Srinagar is quite safe for tourists. Take a look at the article Is Kashmir Safe for Tourists to Travel where I have talked more about this more in details; along with a few tips on making a safe and hassle free trip to Kashmir. So why should you visit Srinagar and not some other place? After all, it is just another hill station and there are plenty of those in our county. So why visit Srinagar? Answer to this question is in the fact that Srinagar is like a perfect recipe for whatever kind of tourism you have in mind. If you want to go out on an adventure with friends, then Srinagar is the place to be. Not only you can cover Kashmir but can also venture towards the valleys of Zanskar and Ladakh. If a family vacation was on your mind then Srinagar is a great spot. There is plenty to see in the city itself, fun places to eat at, quite a few of adventure activities and great markets to shop from. For photography enthusiasts (being one myself), I can guarantee that you won’t stop clicking here. Then there is also the fact that due to all the unrest, Srinagar still don’t get as many tourists like Shimla and Manali. The unrest and tension may be unfortunate but it also ensures that the city never gets over crowded with tourists. So if you want to avoid the crowd but do not also want to go too remote, then Srinagar is the destination you need. In short, this small tourist magnet has on the plate a little something for everyone. Now that is really the easy part. Srinagar is the summer capital of the state of J&K which means that it is very well connected to rest of the country. Depending on your own preference and time in hand, you can reach Srinagar by either road or fly in directly. Best way of course would be by your own vehicle because then it will also make it easier to move around to other places. However, even if you arrived by Air or public transport, you can still find a mode of commute within the city for local sightseeing. Reaching Srinagar by flight will be the most time saving and easiest way of all. Srinagar has its own Airport called as Sheikh-ul-Alam Airport, located about 10 kilometers from the main city. As of now, only domestic flights fly in and out of Srinagar, with Air India to Jeddah being the only international one. On a domestic level however, it is well connected to various cities across the country, including Delhi, Goa, Jammu, Mumbai, Bangalore, Chandigarh, etc. Air India, GoAir, IndiGo, Jet Airways, SpiceJet and Vistara operate regular flights to Srinagar. The frequency is once or twice a day by each airline. Cost per person is approximately Rs 2,500 from Jammu, Rs 2,500-5,000 from Delhi one way and higher from Mumbai, depending on the season; and how close to the date of travel you buy your ticket. After you land, you can get a taxi into town for Rs. 500. For visiting places like Gulmarg or Pahalgam, the cost can be Rs. 2000 to Rs. 2,500 per day depending on the type of cab you chose. Finding a shared cab from the airport would be tough. During the winter season, Srinagar Airport can get blanketed by a thick cover of fog. The city also receives heavy snowfall which leads to low visibility issue which might lead to delays in flight schedules. Winter flights can easily be canceled due to weather conditions. When flying out of Srinagar, make sure you allow approximately 1 hour to get from Srinagar to the airport. Security checks here cause a lot of traffic and it will be a long time before you enter the airport. It sounds like a small airport but it takes a lot of time. Make sure you start at least allow 3 hours to the flight from your hotel. You can also board the airport shuttle leaving every hour from The Tourist Reception Center for about Rs. 100 per person. These buses are quite big with enough space for luggage. Get to the TRC ahead of time though as it could be difficult to locate one of these shuttles there. The bus will take about 30 – 45 minutes to arrive at the airport; and then it will be another 20 – 30 mins for the baggage scan before you enter the actual airport premises. So leave from your hotel accordingly. If you board a taxi from your hotel itself, it will cost about Rs. 500. People flying in from outside the country can reach any of the major international airports in India, such as Delhi, Mumbai, Chennai, Bangalore, etc. and then board a connecting flight to Srinagar. Now this is where it gets a bit tricky. Srinagar has its own railway station but the problem is that it is not yet fully operational and connected. At the time of writing this article; it will take at least another 18 months to 2 years for a full connectivity. Right now, you can reach till Udhampur by train. From Udhampur, you will then have to board a bus or taxi for Ramban. After reaching Ramban, you will then board another train from Ramban to Srinagar. An easier way thus would be to just board a bus or shared taxi directly from Udhampur to Srinagar. Alternatively, you can first reach Jammu by Train; which will actually be a lot easier and then travel from Jammu to Srinagar. More details on this part of the journey are provided further in the article. Also Read: When is the Best time to Visit Srinagar, Kashmir? If you were traveling by public transport like train or by Bus, then it is just easier to reach Jammu first and then find a mode of transport from Jammu for Srinagar. There are JKSRTC buses from Jammu Bus stand Which takes about 10 to 11 hours from Jammu to Srinagar. You can also opt for a private taxi available at both the railway station, Taxi Stand and Bus stand for Rs.2,500 to Rs. 3,000 for a Non A/C SUV; inclusive of all charges. A hatchback like Toyota Etios will cost about Rs. 1,800 to Rs. 2,000 per day. Shared taxis are also available for a cost of Rs. 500 to Rs. 600 per person. You can try to find a direct bus to Srinagar if available from your city otherwise you will first have to reach Jammu by either train or Bus and then go to Srinagar from there. J&K State Road Transport Corporation (JKSRTC) operates fairly comfortable buses from Jammu costing around Rs 350 per person. This bus completes the journey in about 11 hours. There are also direct buses from Delhi taking almost 24 hr to reach Srinagar. Now last but not the least, let us take a look at the route you will be following if you went to Srinagar by your own vehicle; either a car or a motorcycle. For this part of the article, I will explain the route from Jammu; because you will have to cross it irrespective of the city you were coming from; unless you came to Srinagar from Ladakh. Now there are two routes that can be taken to reach Srinagar from Jammu. One is the regular, most commonly used and well known Jammu – Srinagar highway. The other is the lesser known, lesser traveled and more scenic route of Mughal Road. I will explain both. Now this is one what I call as the traditional way of reaching Srinagar from Jammu; via NH44. This is the road that takes you across the famous Jawahar Tunnel and towns like Udhampur, Patnitop and Anantnag. The journey in total is about 270 kilometers and will easily take you around 10 – 11 hours to complete. Traffic jams, long line of trucks and delays are common on this route. Now let us talk about the second road that you can take which also happens to be my favorite. This is really the more scenic of both the routes; but is mostly a single lane highway. This is also the longer of the two covering a distance of 331 kilometers in about 12 hours. From Jammu, you will first reach Rajouri via Sunderbani; and then travel to Azmatbad. A little after Azmatbad is the small town of Bafliaz where you will enter the historic Mughal road. Right after Bafliaz is the steep but amazingly scenic drive to Peer ki Gali, the high altitude pass on this route. After Peer ki Gali, you drive straight 40 kilometers to Shopian where the Mughal road ends. From Shopian, it is a straight run to Srinagar. There is local transport available in Srinagar city. Buses are provided by JKSRTC and operated by some private owners as well. The frequency is quite good and the prices are reasonable. Apart from the buses, there are plenty of auto rickshaws available throughout the city that you can use to move from one place to another. Best way however would be to rent a taxi for yourself which can cost about Rs. 2000 per day but will remain at your disposal. Or you can rent a motorcycle which will cost between Rs. 1000 to Rs. 1500 depending on the bike you chose. If you do chose to rent a bike in Srinagar, then I will recommend contacting Faisal at 9596410670. I have personally used his motorcycles and they are all very well maintained. Due to its high altitude, Srinagar experiences a humid subtropical climate. Weather here remains pleasant during summer and gets much colder than most of the rest of India during winter. The city and the valley is surrounded by Himalayas on all sides. The winter season lasts from December till March and during these months, it can snow here anytime. Temperature at this time remains about 2 Degrees Celsius at an average. Nights will definitely be much colder with temperature dropping as far as -5 Degrees. Moderate to heavy snowfall occurs in this season and even the roads may get blocked for a few days. Spring arrives in April and it is beautiful and blooming all around. Average temperature in March rises up to about 12 to 15 Degrees Celsius. Nights will still be colder with temperature still ranging between 0 to 5 Degrees but days will be pleasantly warm between 20 to 30 Degrees Celsius. Summers start in May and ends in August. The days will be warm (and occasionally hot) with a daytime average of between 25 to 35 Degrees Celsius. Nights in these months will be very pleasant at around 15 Degrees. July also is when monsoon arrives in the valley. It is not really supposed to rain in Kashmir too much but much has changed due to global warming. The 2014 flood of Kashmir and 2018 flood like situation stand witness to the fact. September will again be pleasant and by October, Autumn will arrive and it will start to get cold again. For a more detailed overview of Weather in Srinagar and a month by month breakdown; please read A Month by Month Report on Weather in Srinagar. February is best if you want to see snow. Ramzan and Dates around Eid is not a good time because most of the places would remain closed. Planning around Independence Day and Republic Day is again not a good time because of all the security. June and July may not be best because of Amarnath Yatra and all the pilgrim rush. July and August again won’t be good due to monsoon and if rains make you uncomfortable. Based on the above information, you can decide which month would be best for you; depending on what exactly would you like to experience in Srinagar. For a more detailed write up on this topic and further information, please read When is the Best time to Visit Srinagar and Kashmir? It will depend on which month of the year you are visiting here. In the months of winter, from December till March, you will need all heavy woolens with windproof jackets to protect you from the cold. Do not forget to pack good quality gloves, a muffler and woolen socks. While opting for a jacket, make sure it has a hood to protect your head and face. In the months of April and May, plenty of cottons and light woolens would do just fine. Clothes for Srinagar in June, July and August however means that you just need a light jacket to wear during mornings and evenings. Even that may not be needed sometimes. If you are visiting in September and October, you will again have to bring in a jacket and some light woolens. November and December will again be very cold with night temperature getting close to zero so pack accordingly. An Umbrella can be useful during both monsoon and January and February. Srinagar truly has a long list of places that you can visit. Once you reach here, you will be visiting gardens, lakes, religious sites, historical monuments, markets and will not be done with it all for several days. And once you have seen it all in Srinagar city, then the nearby tourist destinations like Gulmarg, Sonamarg, Pahalgam, Yusmarg and Gurez are just a short drive away. In brief, it is a perfect destination that has a little for everybody and you will simply fall in love with it. I have covered the topic of places to see in Srinagar in a different article because it would have other turned this one page too heavy. If you want a detailed description, then read Tourist Attractions in Srinagar City. On this page however, I will provide a complete list for a quick overview. What to see in Srinagar? I will break it down in different categories. Let me first begin with a list of lakes in Srinagar City and nearby. 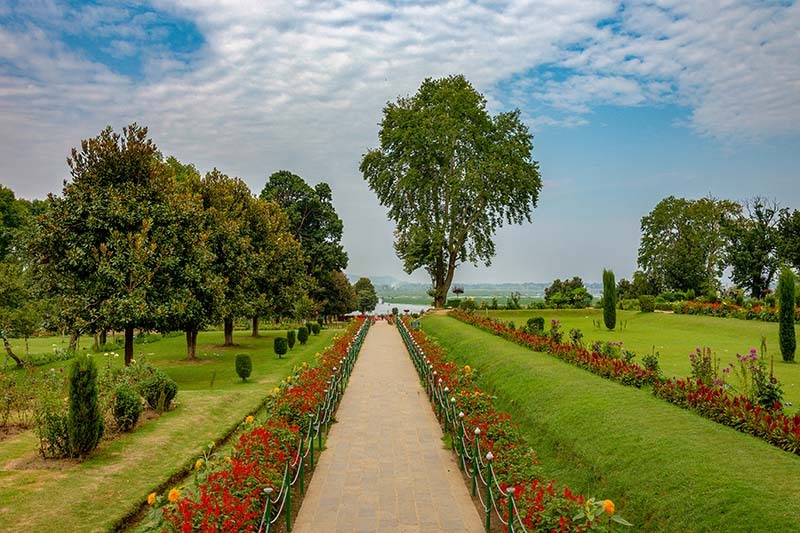 Below is a list of gardens in Srinagar City. Next in line is a list of all places of religious importance in Srinagar City. And finally, a few other tourist destinations that did not fit in any of the categories above. What to do in Srinagar? Apart from visiting all the places I mentioned above, which I am sure will consume most of your time, mentioned below is a list of activities to do in Srinagar. It will cost you about Rs. 300 (off season) to Rs 600 (peak season). Final price will depend on your negotiation skills and I will recommend that you do bargain hard. For better views and a more peaceful ride through a lesser crowded area, walk up a fair bit of distance till you can see the fountain; and ask the Shikara rider to take you for a ride to the fountain. A must see place could be the “village” in the lake. Ask for a ride to the side where locals live and see the floating vegetable market. The market however is usually operational only at sunrise. If you are in for it then you can try your hand at paragliding. The takeoff point for the ride is from Astanmarg, close to the Harwan Gardens at 7,400 feet. From there, you will then fly down to 5,300 feet at Chandpora Grounds in Harwan Srinagar . The number of trails in Kashmir open for trekking is endless; for which Srinagar serves as the base. Last I was told, the number of registered trails was in thousands; but it does need you to of course spend some time and arrange for a guide and porters; both of which you can easily get in Srinagar city. At the least, Photography is one activity that I highly recommend you indulge yourself in. There is plenty to click here and you will end up taking thousands of pictures of the gardens, lakes and historical sites. Be careful where to point your camera though and not take photos of Army personnel and base. While you are here, you must buy some local Kashmiri stuff to remind of the wonderful time spent here. I have covered the topic of shopping in Srinagar further in the article. Like shopping, this is another activity that you just cannot miss. Kashmir is known for its delicious dishes and you must try some. I have provided a list of some Kashmiri food further in the article. Where to Stay in Srinagar? Being a major tourist destination, finding a place to stay in Srinagar is not going to be a problem at all. No matter what your budget is, you will easily find a hotel here; ranging anywhere from Rs. 800 to Rs. 5,000. Whether or not to book in advance is really a personnel choice. I have never booked my stay in Srinagar and was always able to find a room without any problem. Houseboats are one of the most popular form of accommodation in Srinagar. These do not float freely and remain anchored in one place. It is indeed a remarkable experience and you must experience it at least once. The only problem is that you are not then free to move around. Once you get on the houseboat, you remain there. If you want to come to the shore, you would then have to again pay for a Shikara ride to and from the shore. The houseboats that have land access are close to Dal Gate and very noisy; it actually don’t even feel like staying in a houseboat at all. There are houseboats in both Dal and Nigeen Lake. Dal is actually the preferred and recommended place to stay. Houseboats on Nigeen Lake are more expensive of the two. Depending on the time of the year you arrive here, a stay on houseboat can cost you anywhere between Rs. 1500 to Rs. 3500. Hotel Grand Valley Inn is a place that I will highly recommend. It is a very small hotel near Shalimar Bagh but the owners are wonderful people. They are great hosts and will personally make sure that you do not face any trouble during your stay. The family actually run the hotel themselves. I have written a detailed review of the hotel here, Grand Valley Inn – A Great Place to stay in Srinagar. You can view this article for a few pictures of the hotel. The contact number is 9906571500 if you want to call and inquire. If you are a non-vegetarian then you are in for a treat. No one cooks non-veg food like Kashmiri people. But worry not, even if you are a vegetarian then there are several delicious Kashmiri dishes that you must try. I will name a few. One thing you got to remember is that Kashmiri people are not too high on Roti / Chapati. Rice is what usually gets served here and hence the gravy of all these items is not thick. There are plenty of vegetarian restaurants in Srinagar near Lal Chowk; I am really talking about the shudh vaishno dhabas. So even if you were a vegetarian, you will still be OK. Just reach Lal Chowk and ask anyone. Krishna Shudh Vaishno Dhaba near Durganag Mandir is the most famous one and there are several other vegetarian restaurants in the same lane. Kahwah is the most famous and traditional drink from Kashmir and something that you must try while you are here. It is made from green tea leaves with saffron strands, cinnamon bark and cardamom pods. Some varieties of this drink are made as a herbal infusion only, without the green tea leaves. It gets served with sugar or honey, and crushed nuts, usually almonds or walnuts. Preparation and ingredients will differ on where you have it. A strong form of Kahwa is known as Dumtoath. Kashmiri Tea, also known as ‘Namkeen Chai’ or ‘Nun Chai’ is another form of tea that is quite favorite among the locals. It is basically black tea, cardamom, various spices, salt and bicarbonate of soda; and yes, there is no sugar in it at all. Instead of sugar, they put salt in it and that is why it is called Namkeen Chaai. Once again, the ingredients will differ on where you are having it. Try it out and see if you like it. I did so too and could barely get a couple of sips down my throat. I had to ask the tea stall guy to add some sugar so I could drink. This tea is commonly referred to as Nune Toath among Sufis. Alcohol is allowed in Srinagar but you cannot consume it openly of course. There are no restaurants where you could just order a few drinks and sit down to enjoy. A lot of hotels however serve alcohols in rooms or may even have a small Bar set up. If you were looking to buy Alcohol here on your own, then there are 2 or 3 liquor shops on the Boulevard Road; and one in Badami Bagh cantt area. But please make sure that you are not consuming alcohol here openly unless you do want to get frowned upon by locals; or even get arrested for it. What to Buy in Srinagar? Your shopping in Srinagar will consist mainly of handicrafts, leather products, wooden jewellery boxes, Carpets, Chainstich rugs, Cashmere (Pashmina) shawls and Paper Machie products. Just go to Lal Chowk and there are plenty of shops available that you can buy from. If you were here on Sunday then you should try shopping from Sunday Market between Lal Chowk and TRC Fountain. You will get items here at a much cheaper rate. If not Sunday then just go towards Dal Gate. By that I mean take a drive along Dal Lake; and you will reach an end where there will be a lot of houseboats parked, and several hotels and restaurants on other side of the road; in short a crowded area. This is also a good place to buy some cheap stuff from road side vendors. In terms of eatables, you can buy plenty of dry fruits from Srinagar at very reasonable rates. The first thing you need to remember is that only postpaid connections work in the state of J&K. Prepaid phones do not work here and will be dead the moment you enter the state. If you had a postpaid connection, then you will have full connectivity in Srinagar city; irrespective of the network you are on. For other areas of Kashmir though, BSNL has the widest coverage here so BSNL / MTNL users have a higher chance of getting network at places Gulmarg, Sonamarg, Doodhpathri, Yusmarg and Gurez. Also Read: How to Plan your Trip to Alpather Lake? As long as you are in Srinagar city, you will have good data reception with good speed. Apart from your mobile network, most of the hotels here provide WiFi connectivity so you can access internet that ways as well. Do note that that if there is any tension in the valley, internet services get shut down immediately including your mobile data. If that happened, then you will have no way of accessing internet until things get back to normal. Urdu is the official language of the state, but it is mostly used for official purposes only. Locals tend to speak in Kashmiri mostly but only among themselves. Srinagar is a major tourist spot and people here speak fluently in Hindi. Some people speak fluent English as well. So as long as you know either Hindi, Urdu or English, you will be OK talking to the people here. There are some amazing and unique festivals that take place in Srinagar and are worth attending. I am not really talking about festivals like Eid, Urs, Holi, Diwali because these get celebrated all over the country. I am really referring to festivals that are unique to Srinagar. Below is a list. Srinagar has the largest Tulip Garden in Asia, known as Indira Gandhi Tulip Garden. Tulip Festival, celebrated in the months of March – April when the garden is at its full blossom, is definitely worth attending. The Navroz Festival is the new year festival of Shia Muslims and is celebrated with great enthusiasm for nine days. Gurez Festival is the festival of Gurez Tribe of Kashmir and is celebrated in the month of July. The occasion is celebrated with traditional folk dance and music. Shikara Festival is celebrated in the months of July / August. Srinagar is one of the largest saffron producers in the world. Hence, the city organizes the Saffron Festival in the last week of October. Srinagar is a well populated and connected city which is also the summer capital of the state. Almost every Indian Bank has a branch here and have 24 hours ATM. There are plenty of petrol pumps as well as mechanics in Srinagar. You can get every major and minor repair work done in the city. Also Read: Gulmarg Gondola – How to Plan your Ride? There are plenty of hospitals, doctors and medical stores in Srinagar. Whether it was a small ailment or something serious, you can easily get it taken care of in Srinagar. The highway from Jammu to Srinagar, NH44, is a mix of good and bad but mostly average. There are some bad and under construction sections on this road. The route via Rajouri, Mughal Road and Shopian is a single lane highway throughout but mostly remains in good condition. Traffic on this route too is not that much. Roads towards Gulmarg, Pahalgam, Sonamarg etc are all a mix of good and bad. There is no permit needed for visiting the Srinagar city. If you were however planning to go towards areas close to border, like Gurez, Batalik route or areas in Ladakh, then you may need to obtain a permit. I hope the information above on visiting Srinagar was of help. If you have any other questions; or need any further details; please feel free to ask in the comments section below; or at our Community Forum; and I will be glad to answer. I am just blown away by your website. There is so much information. At first I thought, that I would have to send you a questionnaire about my trip I am planning to your beautiful country. But the longer I read on you site, the more questions got answered and the pictures are just beautiful. I am very shocked to read all the violence that is going on. The latest news about India that I read was, that the new high speed train between Delhi and Varanasi broke down and they made fun of the transportation minister because of that. That is just crazy. About the violence, do you think being “a white face” is a disadvantage in a place like Srinagar? Here is my itinerary: At the end of June I will arrive in Delhi from the US and Europe. I plan to fly to Srinagar and spend a few days there to acclimatize (elevation), recuperate (jet-lag) and then take the two day bus trip to Leh. I want to spend a couple of weeks in Leh and its area (Hemis festival) and then fly back to Delhi. I still have that romantic notion about staying at a house boat in Srinagar. Now you gave a bunch of recommendations for accommodations in Leh but not much about Srinagar. What is your thought about staying at a house boat, what would be a good location what are criteria’s to look for when booking and what is a good way to book? Hi Hans – Thank you so much for your kind words. I completely agrees with you, the violence is indeed unfortunate and tragic. To answer your question, yes, you will not find many white faces in Srinagar. People have started to avoid traveling there due to all the violence. But is the place worth visiting? It definitely is. Staying at a houseboat too is a charming experience. When are you planning to visit? I can give you a couple of contacts in Srinagar. They have a hotel in Srinagar but can also arrange for a houseboat. So I understand that it is not a disadvantage to be “a white face” in Srinagar?? I will arrive in India June 27. plan to stay 6 night in Srinagar before I take the bus to Leh. I appreciate if you have a contact I can use, thank you. What are the “safe” must see places you would recommend in Srinagar? Also what online forum would you recommend to stay up to date with what is going on in Kashmir? It is definitely not a disadvantage. You will find foreign tourists there but just not that much. Gulmarg, Pahalgam and Sonamarg are very safe and can be called as must visit destinations for tourists. Please talk to Faisal in Srinagar at 9596410670 in Srinagar. His email is FaisalNazir96@gmail.Com. He can help arrange your stay at houseboat, cab for local commute etc. He is a reliable fellow. Keep checking this link please for updates. Fantastic. Glad you’ve started the convo on visiting Srinagar. Could you please suggest stay options for Pahalgam and Gulmarg? My parents are traveling in November. Thanks much. Thanks Farhin. Both Pahalgam and Gulmarg have lots of hotels and November is anyways off season so you will have no problem finding a hotel there. Hi Vargis Khan, to my question above, any suggestions? ?